To date, Courtney Barnett has built momentum based on a pair of Australian EP’s that were released stateside last year as a single disc: A Sea Of Split Peas. 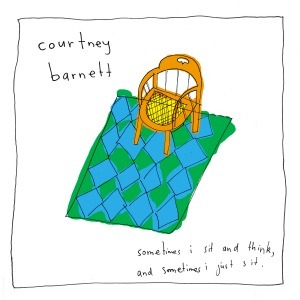 The infinitely quotable Barnett has upped the ante for her proper debut, Sometimes I Sit And Think, And Sometimes I Just Sit, heavily involving her potent touring band, Dan Luscombe, Dave Mudie and Bones Sloane, to ensure a consistency of sound and a stunning rock edge. Her greatest parlor trick is making the Australian detail completely relatable. The singles were chosen wisely, with lead cut “Pedestrian At Best,” thumbnail reviewed by her father as “shouty” – a recommendation in our book! The follow up, “Depreston,” is a laconic shuffle that spotlights her attention to both detail and human nature in a real estate transaction: “Well, it’s a deceased estate, aren’t the pressed-metal ceilings great?” True to the title, Barnett betrays a perhaps unhealthy amount of time looking at ceilings, but if this is the key to her torrent of words, then carry on. “Dead Fox” sports not only some of Barnett’s finest imagery (“taxidermied kangaroos are littered on the shoulders, a possum Jackson Pollock is painted on the tar”) but also wormy guitar figures displaying that as much time was spent on the music. The emotional core of the record is found in the guitar exorcism of “Small Poppies” and “Kim’s Caravan.” Both burn slow, but explode into unforgettable climaxes. Before the dust settles, the ghostly ballad “Boxing Day Blues” sails into the sunset with an outro that has you leaning into the speakers, not wanting it to end.